If you’re a man who wants something unique and prefers a non-shiny finish, JustMensRings.com has a nice surprise in store for you. Our men’s titanium wedding ring with a hammered texture offers a unique appearance that demands double takes. The hammered texture of the titanium lends an ethereal feel to this spectacular ring. Finding the person you want to spend the rest of your life with is no small task, and we designed this ring with such meticulous attention to detail to ensure that it’s as unique as the special bond you share. Each 8mm men’s titanium wedding ring with a hammered texture features a comfort-fit design to accommodate men with large knuckles. Comfort-fit rings are aptly named because they’re comfortable to wear all day long. Furthermore, comfort-fit rings are easy to remove. 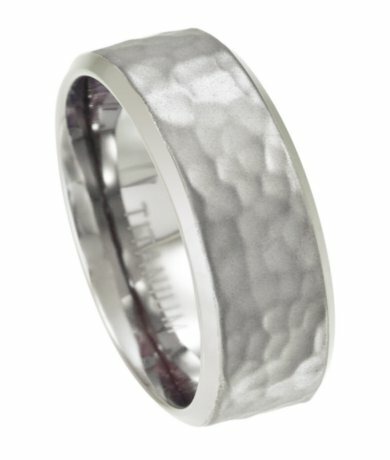 The men’s titanium wedding ring with a hammered texture provides traditional beauty with a modern twist. Titanium is quickly becoming a popular alternative to palladium, platinum, white gold, and other silver or white metals. What men love most about titanium is that it is lightweight yet incredibly strong. Titanium will resist corrosion and discoloration for the lifetime of your new ring. Because comfort-fit rings tend to measure a half size smaller than traditional bands, we recommend that you have your finger sized for a comfort-fit ring by a professional jeweler to ensure that the style is right for you. If you have any questions about the 8mm men’s titanium wedding ring with a hammered texture, please contact us today to learn more. I got this as a replacement for my gold wedding ring that I lost in a swimming pool. It was a similar hammered texture. I love these rings because I use my hands a lot and they don't show wear. This titanium version was a great value and should be more durable. I waited a long time because I thought there would be a heavy price to replace the original. I wish I would have run across JustMensRings sooner. I used their size chart but the first ring I received was a too big. They were great about returning. This ring is fantastic...light but tough. Excellent customer service as well...will purchase from JMR again. I bought this ring for my husband and had to get a smaller size. JMR exchanged it with no issues, shipping was fast, price was soooo cheap, and ring is exactly what I wanted! No complaints. Fast shipping and great price. I really like the ring and it is exactly what I was expecting from the description. It is very comfortable and lightweight, which is why I got it, to replace a stainless steel ring I was wearing. The SS ring weighed more. This ring is lighter and I don't even notice it is on which is a positive for me. I do like the look of the ring and it fits very well on my hand (unlike some other rings I have tried). I had tried some other rings and they started to cut into my finger when I would work out, but this one seems to work well and I've gotten compliments on the look. The one thing I would comment on is that I found the finished edge a little rougher than I would like so I buffed it with steel wool. It would not cut your hand but it was just a little less finished than I would have liked.